So this is my entry for the next fortnight theme. 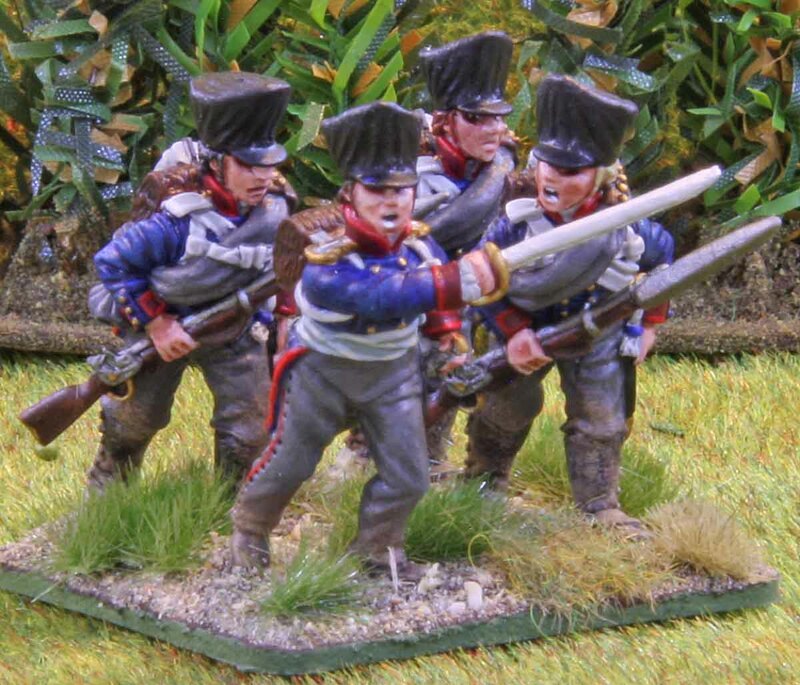 I have long had these minis and for a long time I wanted to turn them into a casualty marker for my Napoleonic games. 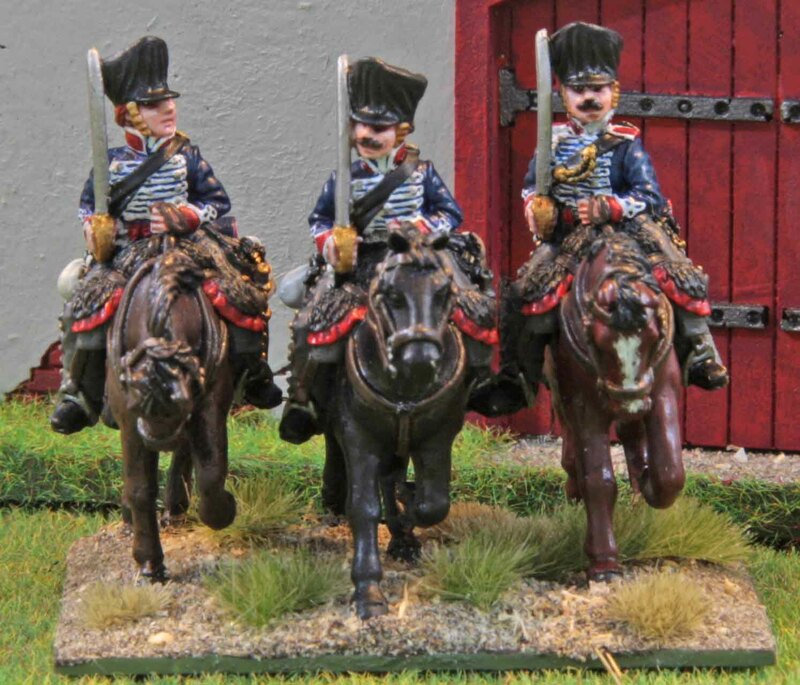 The minis are from Warlord Games small Napoleonic Prussian range. 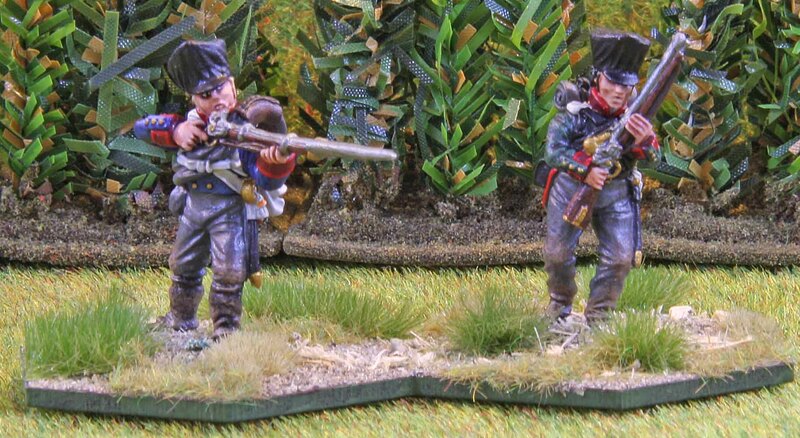 While the plastics are an absolute pain in the behind due to their soft detail and undercuts these casualties are just brilliant… characterful faces, crisp detail and great interaction between the minis. 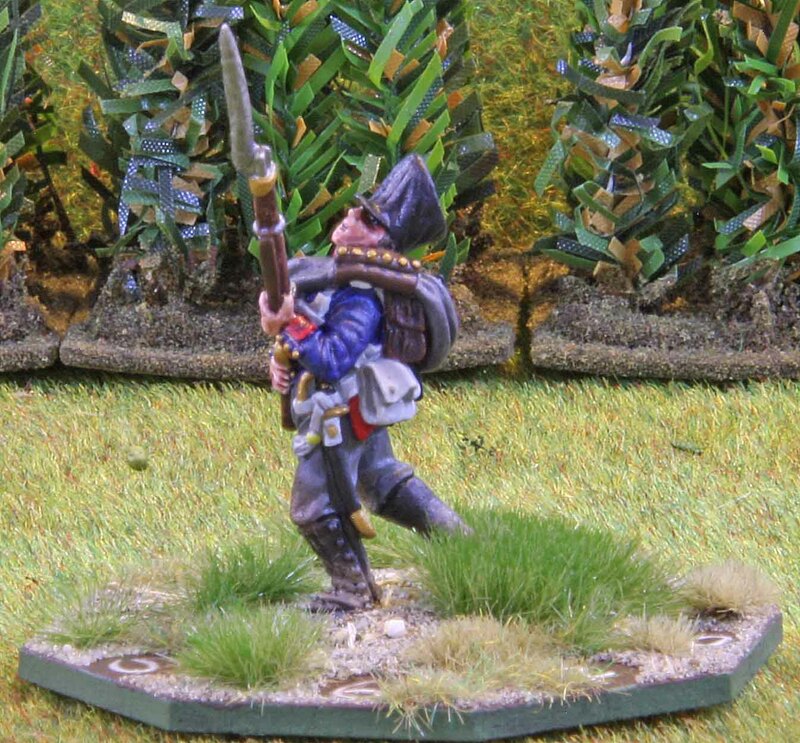 The only change I made was replacing the banner to be carried by the wounded soldier with a musket (from a Victrix French Guard set). Warlord means these minis to be used as part of the unit, where a banner would be fine, but I felt that on a casualty marker this would just draw too much attention, so I did without. 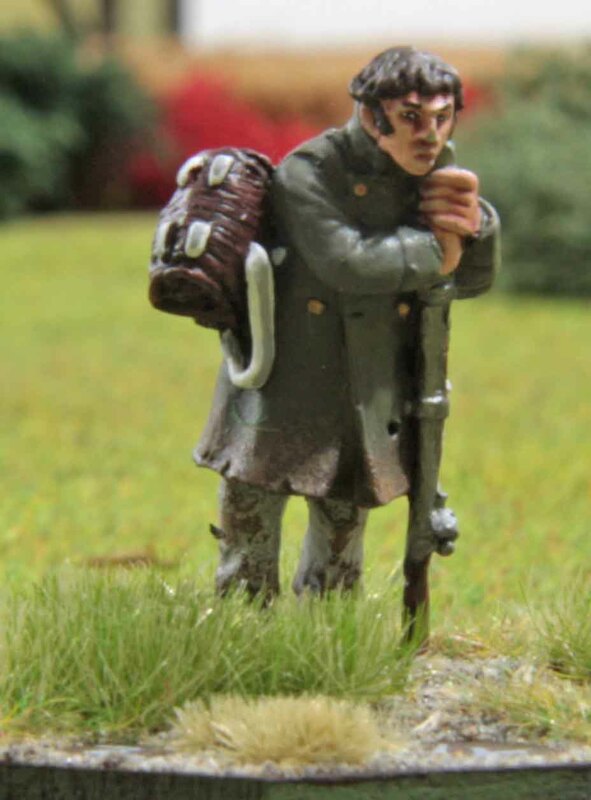 The minis were painted up to act as a casualty marker for a unit of silesian Landwehr or more specifically the 3tes Battalion, 13te Schlesische Landwehr, as denoted by their yellow shoulder boards. But there are also some more casualties. I initially planned to do these as part of the fortnight theme, but after not doing so well on the last two rounds and since it seems I am unable to take proper photos this year (even if my life depended on it), I decided to stick to just one base of minis for the theme round and here is the rest. 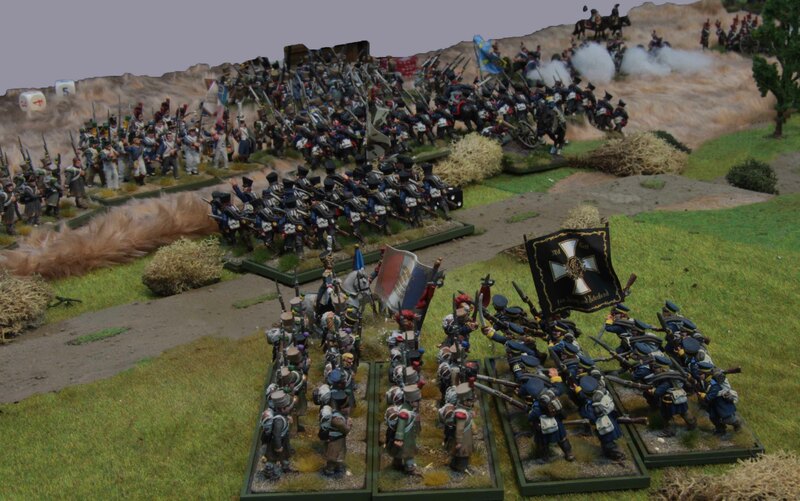 I painted a awful lot of Napoleonic French and Prussian units over the past 2 ½ years and one thing that is missing are casualty markers for them. As as part of the Challenge I decided to paint a few more up, to beef up their meagre ranks. 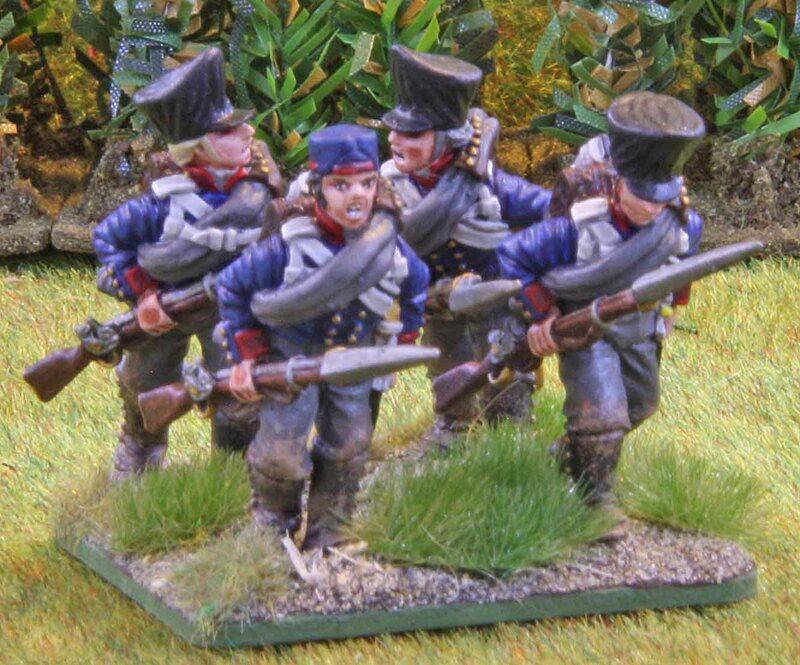 The French are from Perry Miniatures (metal). Virtully all my French are wearing greatcoats and to my knowledge these are the only two French casualties in greatcoats around, so I simply had to use these. 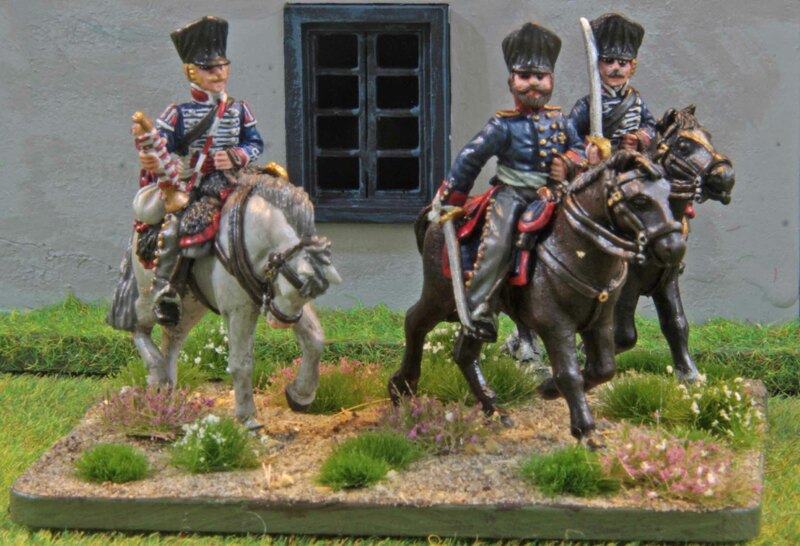 The other is a Prussian Regular by Calpe Miniatures. The brick-red collar and cuffs denote him to hail from a Brandenburgian unit. All of them are mounted on octagonal bases, each numbered through (by my better half… my hand writing is rubbish). While this is not really a fabulous new idea, I do not like the bases with the integrated casualty wheel (too thick for my taste). They are placed behind the unit that took casualties, with the side that matches the number of casualties facing front. They are placed left or right behind the unit depending on the moral state they are in. The clever bunnies amongst you will realise, that some units may take more than eight casualties. In that case the counter os moved one base towards the centre of the unit, with each base it is being moved denoting a +8. But I already explained this in more detail in an earlier post for those interested. And one more shot. When taking these photos, I did not realize, that the shutter was still still open on the camera when removing the mini. This created a somewhat ghostlike shot that I wanted to share with you. And as usual… here is the link to the special page Curt set up for you to see (and cast your vote) on all the entries. Deployment was quiet straight forward. The French Troops under Lagrange were deployed inside the village of Möckern, with the Légère being deployed behind it as reserves. 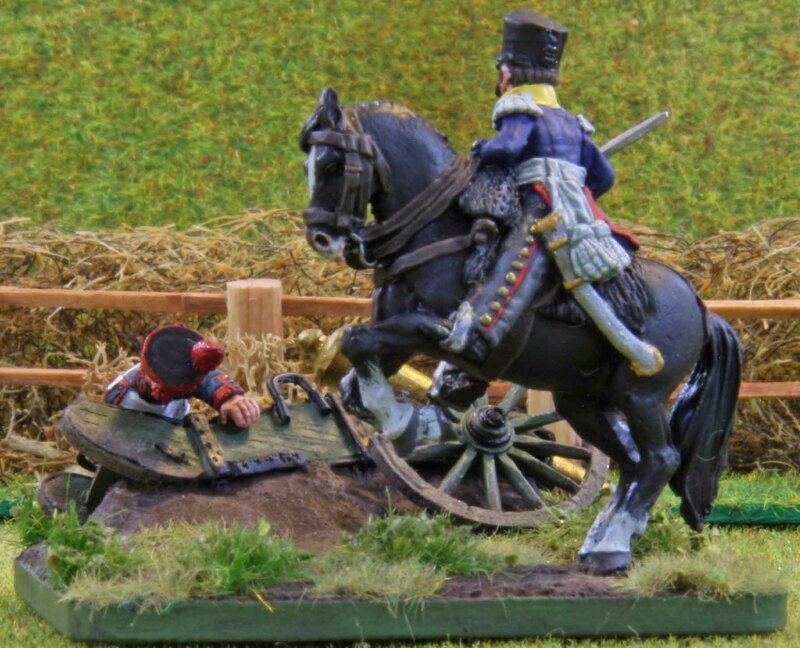 They could only be released after the first Prussian assault on the village itself. The troops under Buquet were deployed on the fields east of the village. The French artillery was positioned in between these two formations. The Prussians under Klüx were deployed opposite the village, with the Leibgrenadierbattalion being kept back as reserves. They could only be released after the first unsuccessful assault on Möckern. The Second Detachment was deployed on the fields east of Möckern opposite the French lines. The Prussian 6pdr. batteries were deployed between the two formations with the cavalry behind them. Th horsemen would stay in reserve until von Yorck saw the moment fit to unleash them. At the earliest this could happen on the fourth round (they would be released on a roll of 6+ on a D10 with each previous attempt giving them a +1). The 12pdrs. were not deployed on table but off table and would start firing on the fourth round. 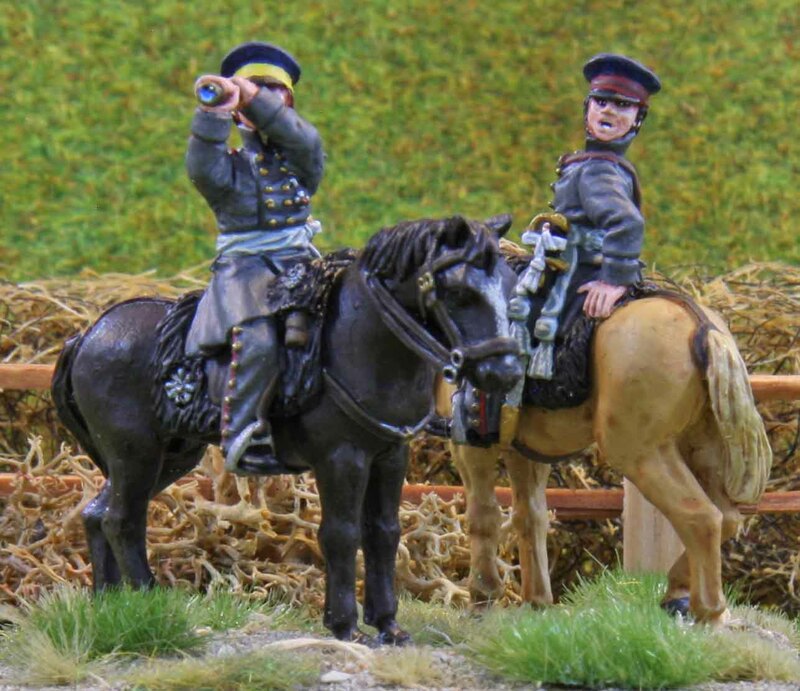 The Prussians won the first initiative (they would actually did so each round) and began a general advance. On their right the Gardejäger had deployed the whole unit as skirmishers and it was behind them that the Landwehr advanced, with the Ostpreußisches Infanterieregiment to their left, both in line. On the fields Two regular and the reserve battalions were at the front deployed in Collums of Attack with the Landwehr battalions advanced behind them in line. The artillery opened up on the closest French infantry on the fields, without doing much damage. Initiative passed over to the French. While the troops inside Möckern naturally stayed put and those in the fields advanced slowly in line. The two French batteries split their fire between the Westpreußisches Grenadierbattalion on the fields and the Ostpreußen near Möckern. They too only inflicted moderate damage. Now it was the Prussians turn once more. The troops opposite Möckern continued their advance with the Gardejäger opening fire at the defenders doing the first damage. On the fields there was a further advance with the 12te Reserveinfanterie preparing to charge. But before they could do so it was the artilleries turn. 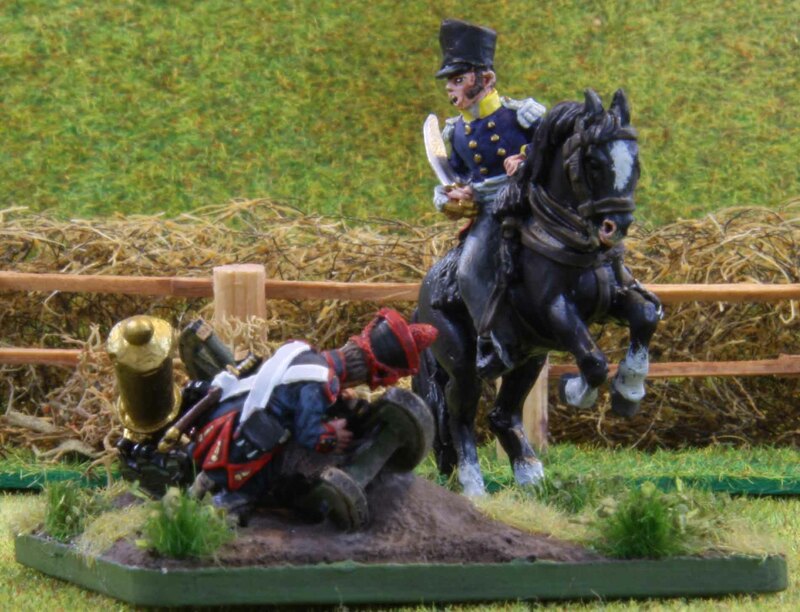 The left battery had to shift its fire to the French artillery on account that part of the Prussian lines now obscured the French and managed to put the crew for two of the French guns out of action, while their companions still created more damage for the infantry. Now the reservists charged the French to their front. The French fired a defensive volley at point blank range, but still they went on. Both sides already inflicted heavy casualties on the other, but not enough to send one running. But after continued heavy hand to hand combat the French broke and ran, never to return. But at a heavy price with the reservists having lost more than half their number. But still they stood fast. On their next turn the French in Möckern still just held their ground. The troops on the fields contented with just firing at the Prussians to their front without doing much damage or with sending some infantry to re-crew the French guns. Only the French battalions from the second line (now front) opposite the 12th Reserveinfanterie charged them. The Prussians were still disordered from their own attack and while they managed to get some defensive fire off they were unable to break the French impetus and after short combat broke themselves. They would still be retiring at the end of the game. Again the French artillery fired at both the Grenadierbattalion on the fields and the Ostpreußen near Möckern inflicting more damage, having found their range. Back to the Prussians the action went. Near Möckern they advanced further, but the Ostpreußen now decided to deploy as skirmishers to lessen the effects of the incoming artillery, which would work out, but at the same time meant they would be less effective assaulting the village. On the fields the 14te Schlesische Landwehr got into position to charge the French who had just broken the reservists, but faild to get their morale up for the charge. Unfortunately the same happened to the Brandenburgisches Infanterieregiment. The Grenadierbattalion decided to fire at the regiment to their front, since the second artillery battery could now longer fire at the french infantry either. And their fire proved effective enough. 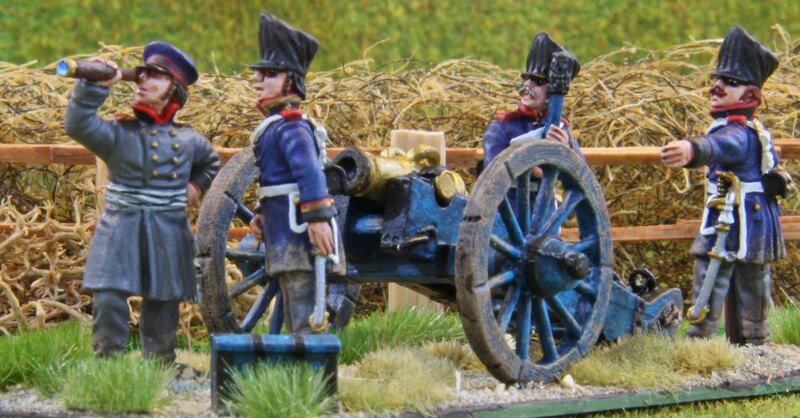 With the second Prussin artillery battery now shifting its fire to the French artillery as well, they caused impressive damage, killing all the infantry replacements for the crew plus the crews for another 4 guns! Now the French defender inside Möckern remembered that they could fire back, which they did causing minimal damage ion the Gardejäger. 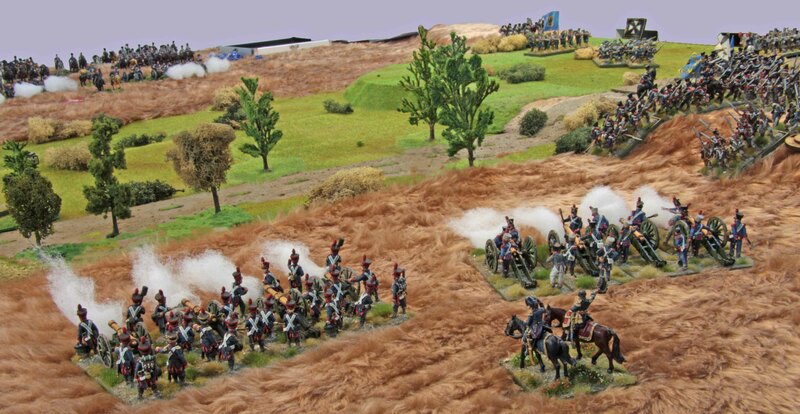 On the fields most of the French proved happy firing at the Prussians with moderate effect and sending yet more infantry to help redrew the French guns. The French who had previously dispatched the reservists now decided to charge the Landwehr in position to charge them. Their superior numbers and quality proved decisive and after heavy losses of both sides the Landwehr pulled back.. The French artillery virtually did nothing this turn. One battery was in no state to cause much damage and the other failed to make an impression on the dispersed skirmishers of the Ostpreußen. On their next turn the Prussians did extremely well. Both the line Regiments on the fields charged their French opposites causing both to break and run. Together with the previous losses and those troops send to help the artillery this only left a nucleus of French on the fields. 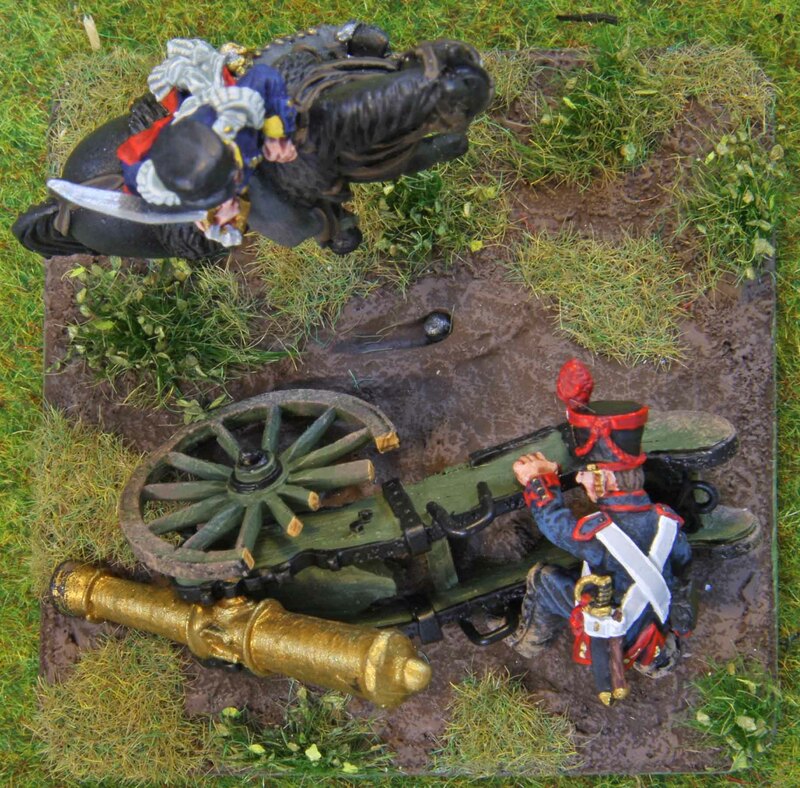 While the Gardejäger caused some further damage on the French defenders of Möckern the real star was the artillery. 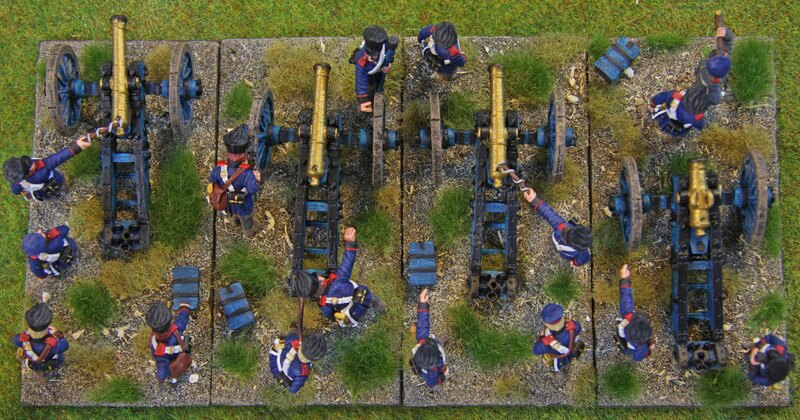 One of the Prussian batteries shifted their fire to the next French battery taking out the crew for one gun. But the other one annihilated the mauled French battery taking out the remaining crew and damaging the guns before the French infantry even got a chance to redrew them. 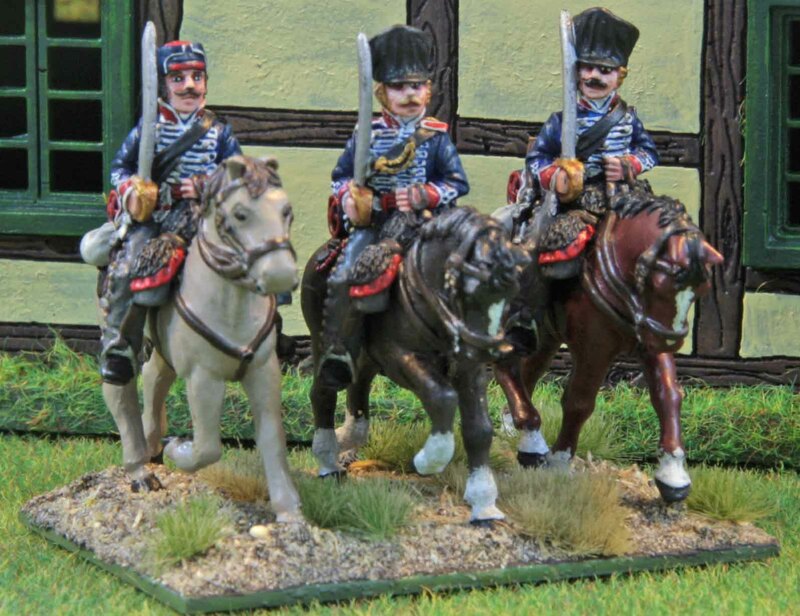 To make matters worse for the French the next round would also see the Prussian cavalry released. At this point the French player decided to call it a day. Late November we began our Möckern game. Due to vast amounts of chatting and calling an end early that day we only played one round and decided to pick it up last night. Well… while we played longer (real-time) we only got half a round done, due to rules discussions and discussing what would be historically correct. In the process we found that we had made a mistake during the resolution of close combat, moved the minis back, began the close combat anew, discussed what could be done differently as a house rule, tried that out and so on. Bottom line… we botched the evening up for good! So in the end we decided to reboot and start the game from the beginning either between Christmas and New Years or in early 2014. No matter what… I managed to take a couple of nice photos, that I want to share! So what is next? Well tomorrow Curt´s Analogue Hobbies Painting Challenge starts. I already have a good amount of British Tanks and Infantry (all WWII), SS end a few Napoleonics cleaned up and primed ready to go. More will follow when we are off to visit my better halfs relatives over Christmas, so there should be plenty of stock to work from (plus I am expecting my Warzone minis any day now). 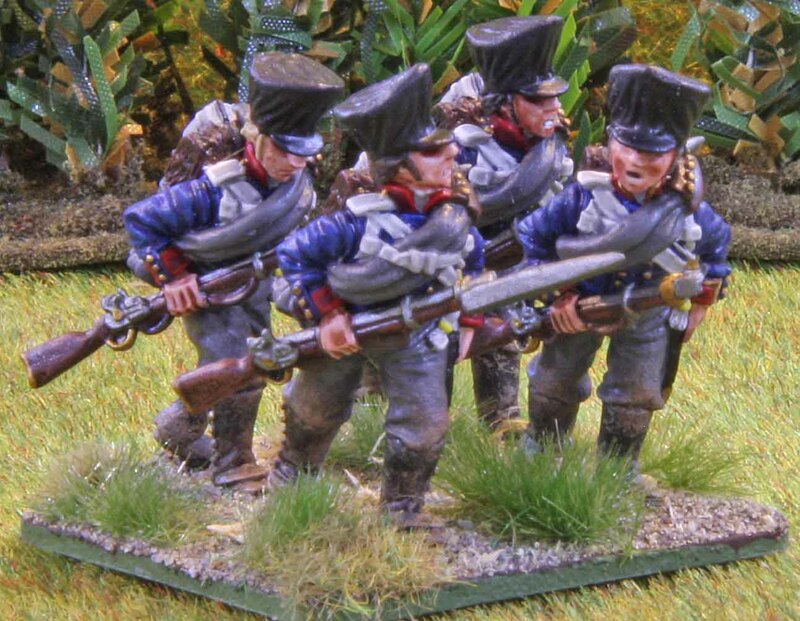 As I said in a previous post, the first fortnight theme (non-combatants) was giving me some headaches, but I think I shall have that sorted out with a nice Napoleonic entry. So stay tuned! 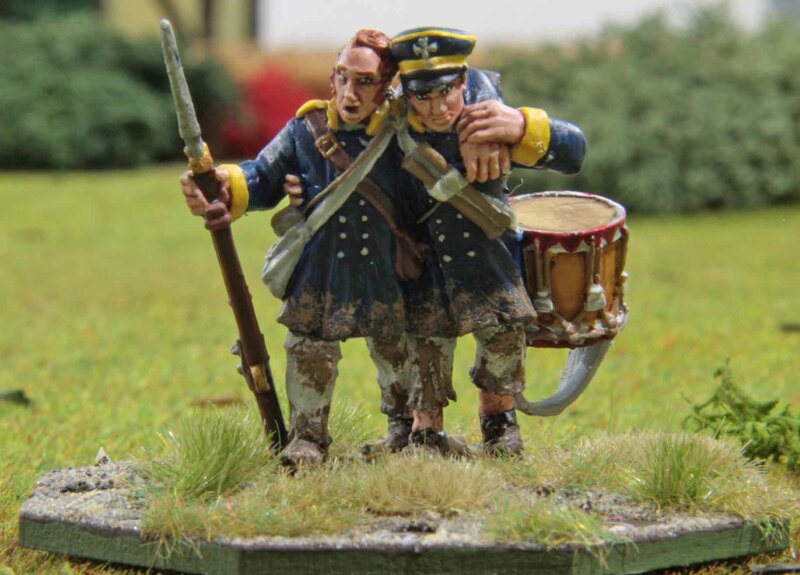 As promised the other day (and just a little late) here are some pictures of the last two Prussian officers I painted for the Möckern game. I have to admit, that with these two it is pretty hard to find some conclusive information on what they did before or after the battle. So I can not really tell which unit or province they came from. On the other hand this left me with some freedom as to how to depict them. Up first is Major von Hiller who commanded the Prussian infantry at Möckern. I have some information on Major von Hiller. His full name is Baron August Hiller von Gaertringen. His father is from Wurttemberg in the south of Germany. August was born on 11 November 1772 in Magdeburg and died on 18 January 1856 as one of the last veteran officers of the Waterloo battle. As he was wounded at Möckern, he did not participate at Blücher’s Rhine crossing, but joined the army laster and was engaged in the conquest of Paris. 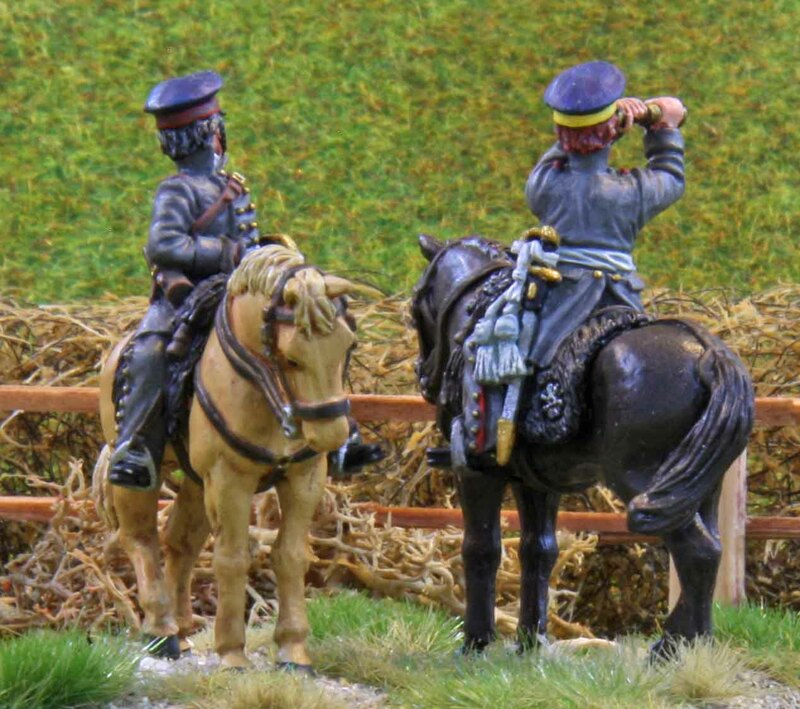 At the Waterloo battle he had a decisive role as he was leading the attack on Plancenoit. Now rank wise he was not the highest ranking officer at Möckern. That was Oberst Katzeler (see below). Depending on what book you read, this also leads to some confusion as to who commanded the advent grade at Möckern as most authors choose one or the other to have done so. 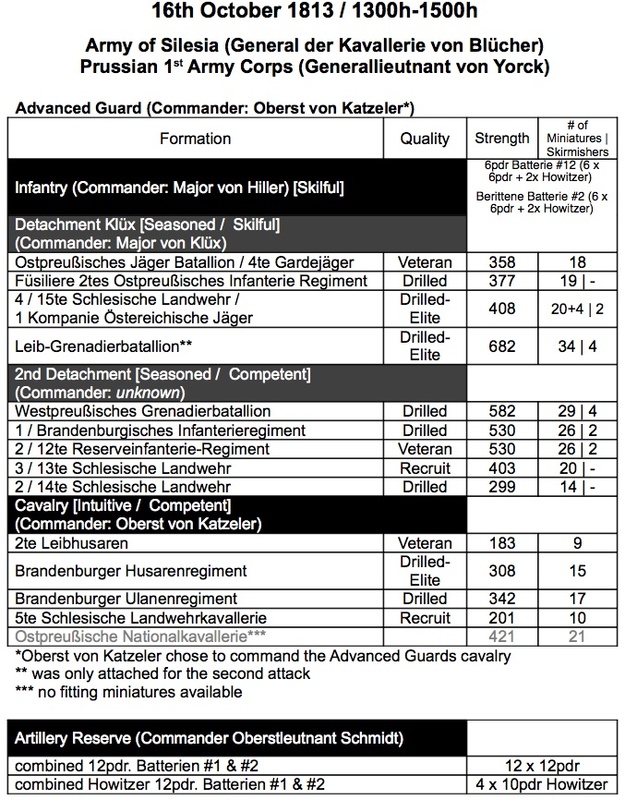 Reading through the Prussian after action reports you get the impression, that Oberst Katzler was in command of the advent grade, but passed command on to Major Hiller and did lead the cavalry instead. 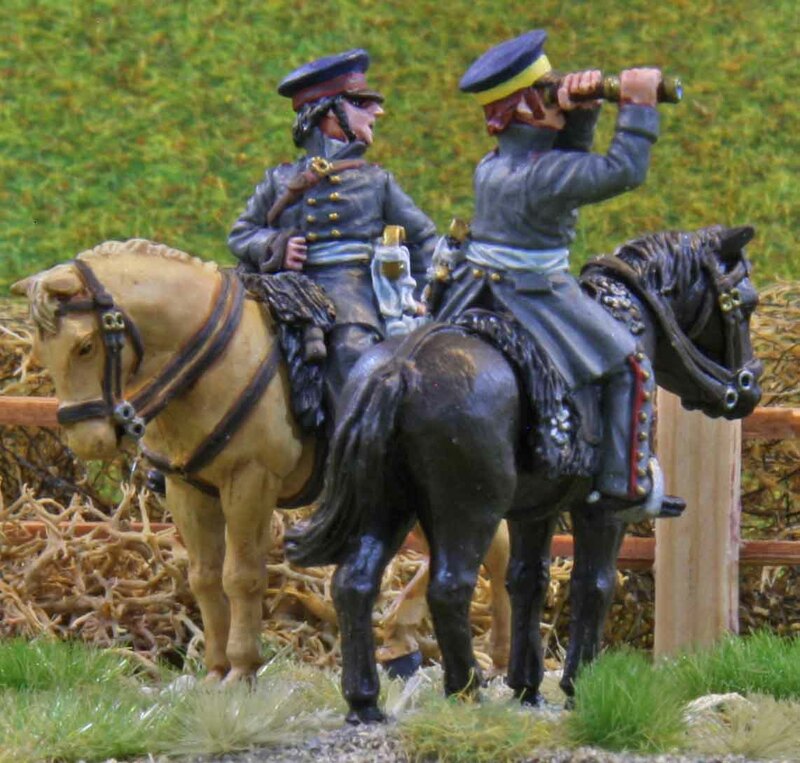 Some notes mention that he was Oberst der Kavallerie (Colonel of cavalry), so he probably felt more comfortable leading the mounted troops than the infantry. But this also presents a slight dilemma for me from a modeling perspective. Given that he was command of roughly three brigades worth of troops, he should have a medium sized base under the Republic to Empire rules. Given his rank it should be a small one. Since I was unable to find any historic drawing or paintings of the man I was aiming to keep his base rather generic anyway. 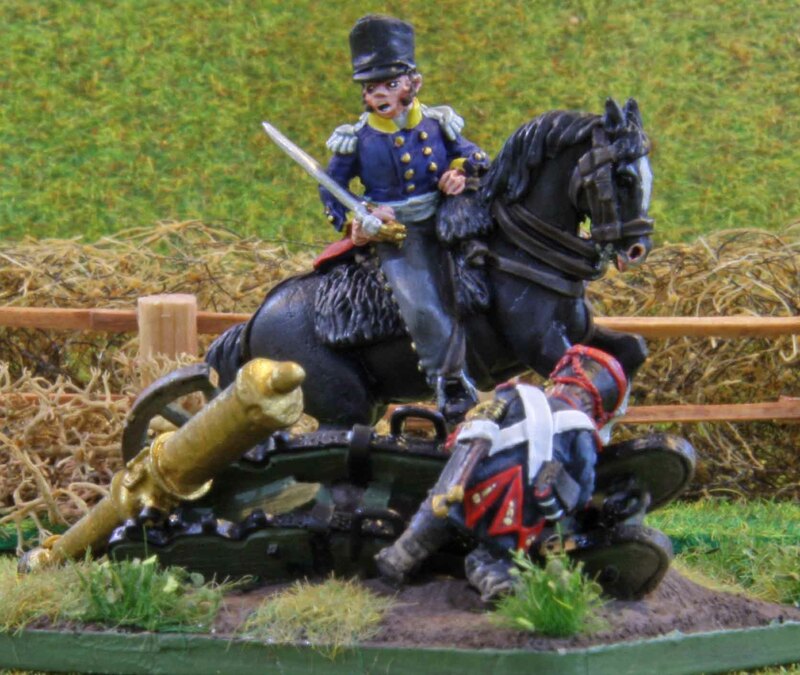 So I chose the small base but put two horse mounted officers on it to indicate his higher responsibilities (with most brigade commanders I just use one mounted officer and one or two infantry minis). Both minis are from Calpe. One (who is to depict von Hiller) is wearing Silesian yellow. Given the number of Silesian troops in the advent grade, this seemed fitting to me. The other officer is wearing East Prussian orange. I really like the combination of orange and dark blue and since there was one East Prussian unit, I felt this would be acceptable. I already said a few words about Oberst Katzeler when talking about von Hiller so I will mostly go into the the choice of minis here. Being an Oberst he was benefitted with a larger base and to fill that up, I put two more mounted soldiers besides him. 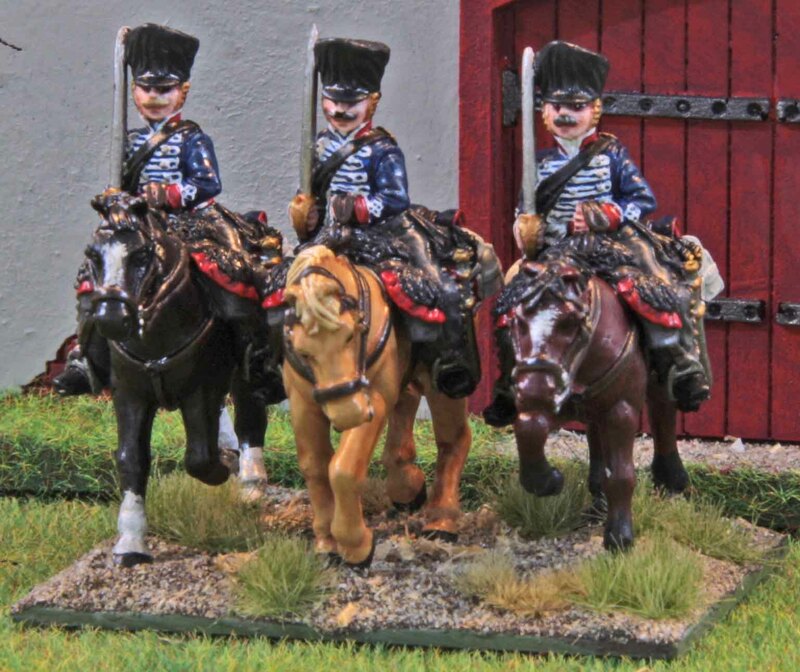 Since he commanded the cavalry at Möckern, I felt that these should be men from a cavalry unit and which unit would be more fitting for that than the Brandenburg Hussaren. Those of you looking closely will notice, that the mins for Katzeler is actually the same as the one for von Hiller (just on different horses). I only noticed this when I was just about to start painting them. In all honesty, I should not really have cared, since they will most likely never be right to one another on the tabletop, but I was painting them both in one go and it bothered me. Now the easiest solution would have been to use a different mini, but since I was already hard pressed for time, I did not want to dig through my lead pile, clean and fill the gaps up and base coat another mini up. So I just kept him and sculpted a beard on the man. Very small addition, but it made a huge difference when it comes to his looks. 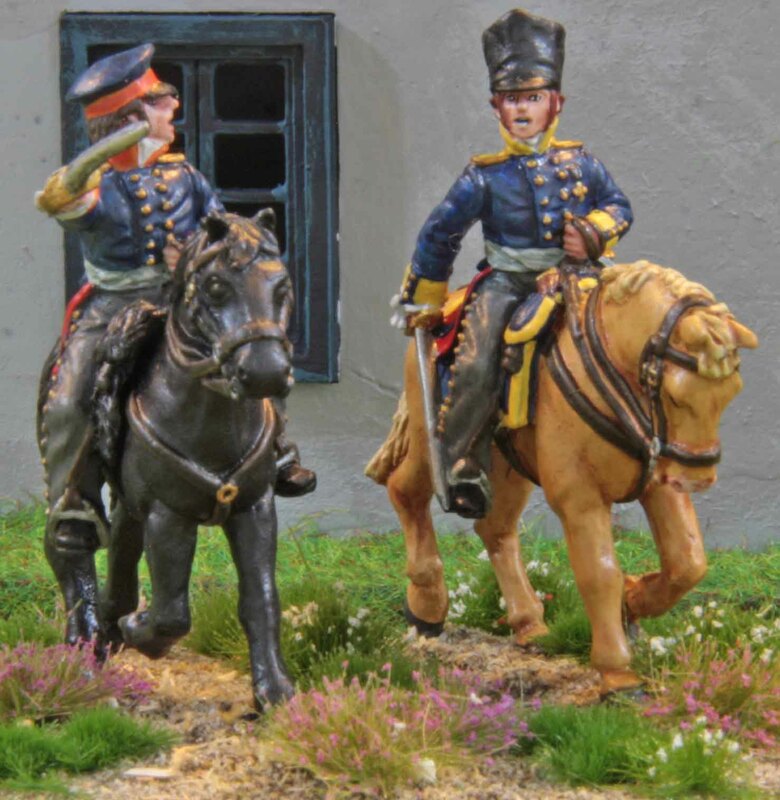 Otherwise I just painted him up in Brandenburg colors, which seemed the right thing to do with the high number of Brandenburg units in the cavalry force. Again all minis are from Calpe. So as announced last month, here is the first in the series of posts meant to catch up with what I painted in November (precious few actually). 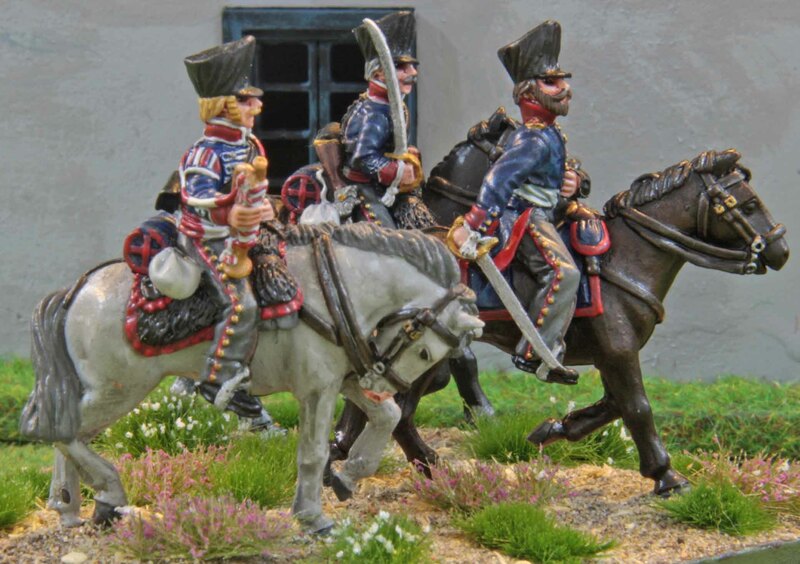 This time it is the Brandenburg Hussars, or as one could say, the most illustrious unit in a row of illustrious units that fought at Möckern. The Nr. 3 Hussaren Regiment, Brandenburger Hussaren (also known as Zieten Hussaren) was founded in 1730 and named after its first Colonel, Hans Joachim von Zieten. 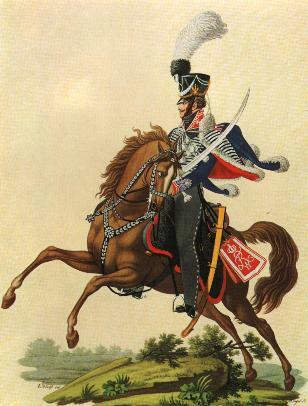 During the 1806 campaign, the regiment was known as von Rudorff Hussar regiment, soon renamed Nr.2 Leib-Husaren von Rudorff). The regiment was disbanded after it capitulated at Ratekau following the defeat of 1806. 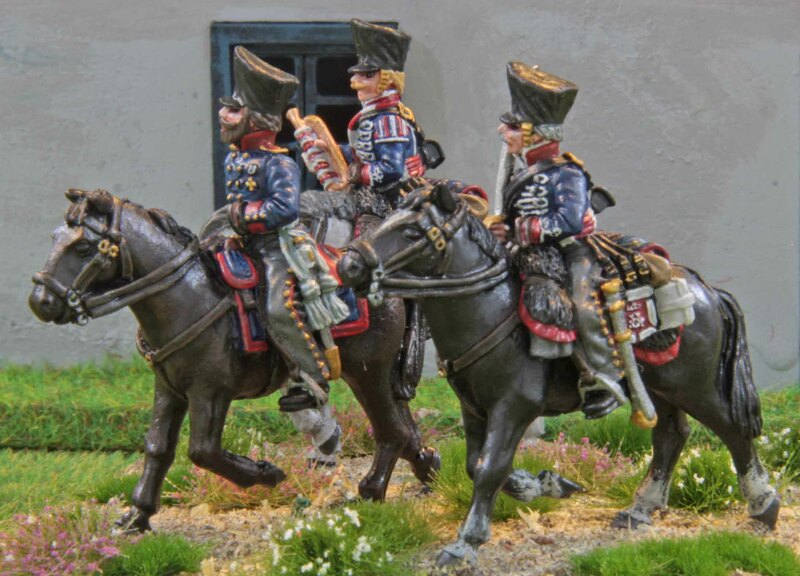 In 1807 it formed a squadron in its former depot as Freikorps Marwitz and amalgamated with Blücher’s Corps to create the 1st Brandenburg Hussar Regiment on 7 September 1808 (Husaren Regiment Nr.3). 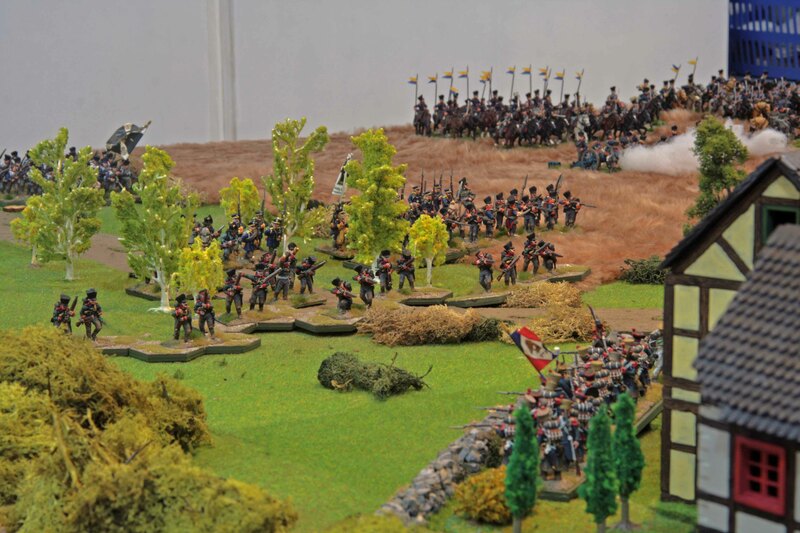 The regiment’s 2nd squadron served during the Russian Campaign of 1812 on the French side. 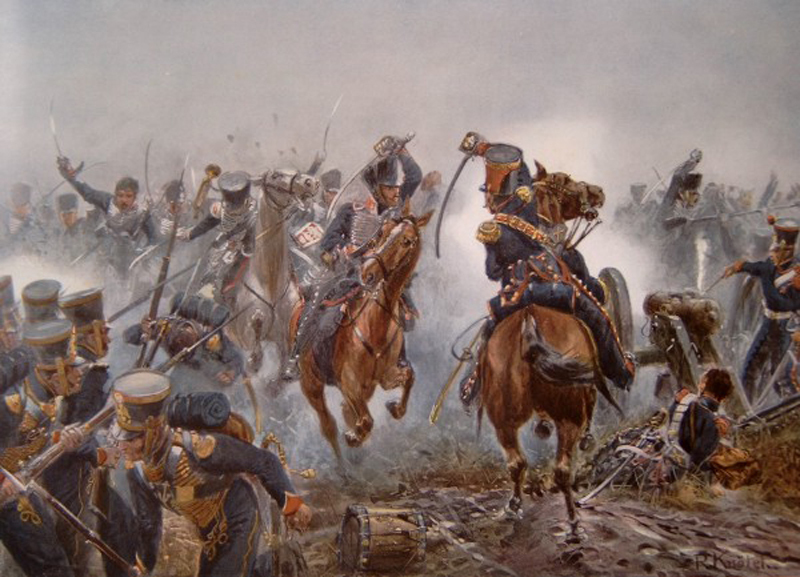 But with the beginning of the Befreiungskriege just like the rest of the Prussian Army it fought the French once more, taking part in all of the 1813, 1814 and 1815 campaigns. But as most will agree their finest hour was at Möckern. When von Yorck saw that in spite their best efforts, the infantry was failing to take Möckern and the surrounding fields, he unleashed the cavalry. Now the French infantry was in no good state at that point of the battle and there are many accounts of some of their officers leaving (some would say deserting) their units to attend important business at higher commands. When the cavalry, lead by the Brandenburger Hussaren, hit them, their squares were not properly formed and broke under the cavalry attacks. So with their charge, the battle for Möckern was won. Many say that this loss forced Napoleon to reposition his units and eventually led to his his defeat at Leipzig. In 1860, the regiment became part of the federal army of Germany and continued to serve into the first World War. 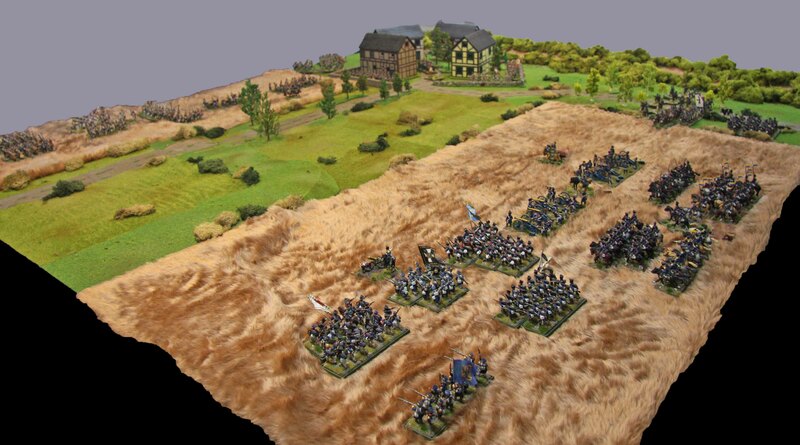 So up next are the two missing command bases for the Prussians at Möckern. You can expect those either tomorrow or on Friday. Prussian Leib-Grenadiere König Friedrich Wilhelm III. (1. Brandenburgisches) Nr.8. 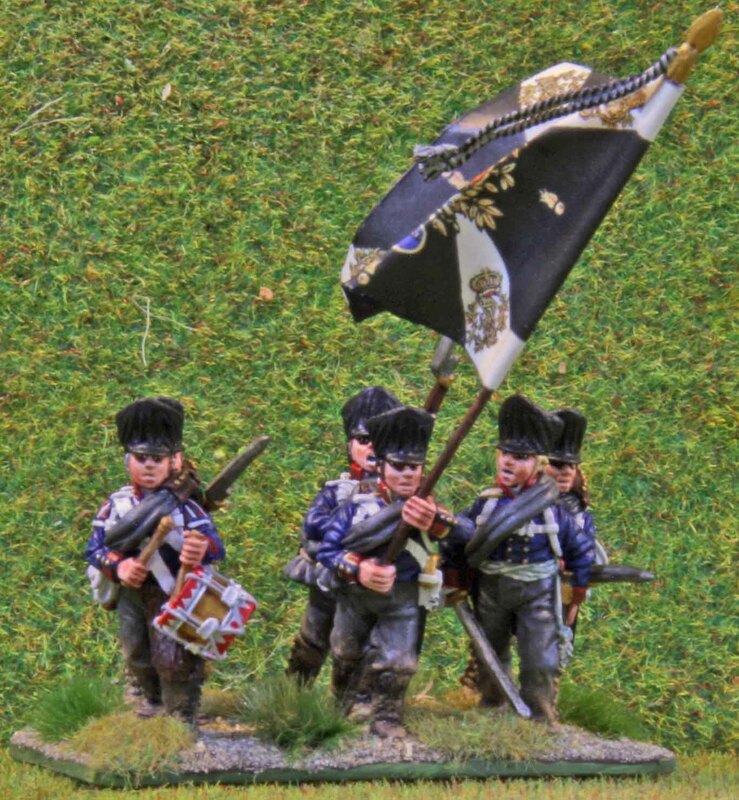 So slightly behind schedule here is the latest addition to my Prussian forces for Möckern… the Leibgrenadierbattalion. 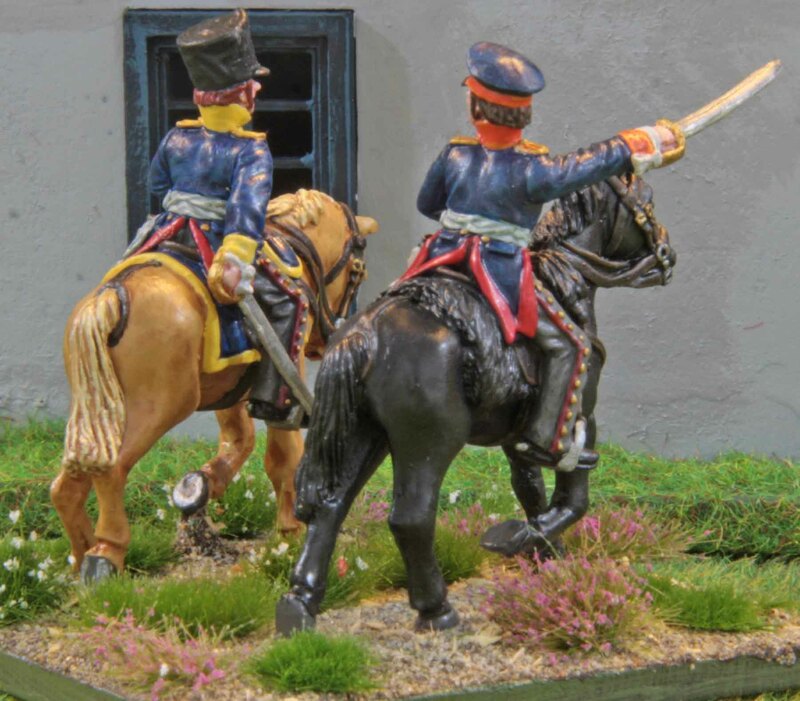 Now for those who are constant followers of this blog, they will remember them from last month post about the 1 / Brandenburgisches Infanterieregiement (also known as IR 8), for until June 1813 the Leibgrenadiere were actually their Fuisilier Battalion. They were also named after King Friedrich Wilhelm III, for he was their nominal chief from 1808 till 1840. For all their career during the Befreiungskriege they shared very close ties with their parent unit, fighting in the same battles as they did. For a personal point of view there are a lot of things to say about this unit. 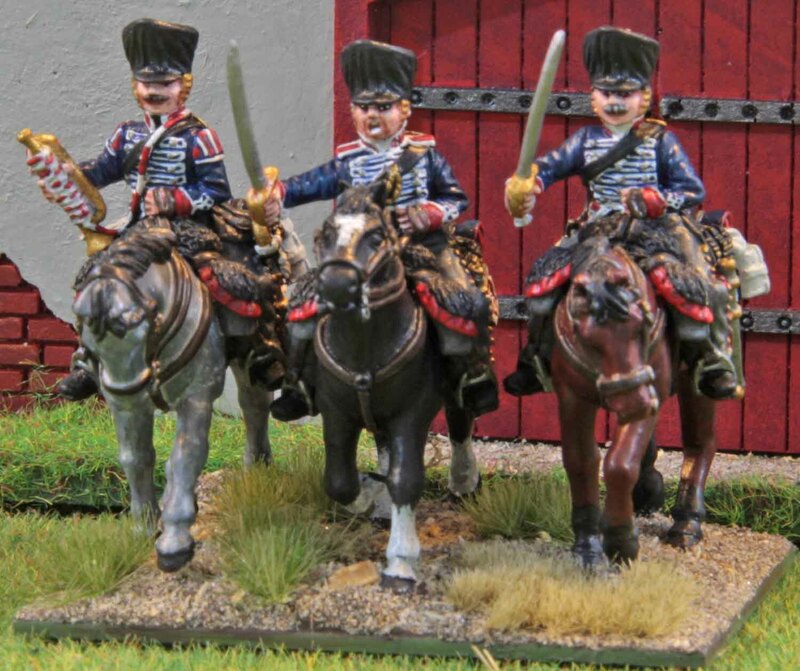 For one… it is now the largest Napoleonic unit I own. They fought at Möckern with 682 men, which translates into 34 minis plus four skirmishers under R2E (they therefore surpass my previously largest unit, the 4. Bayrisches Linien-Infanterie-Regiment “Sachsen-Hildburghausen”, by two minis). 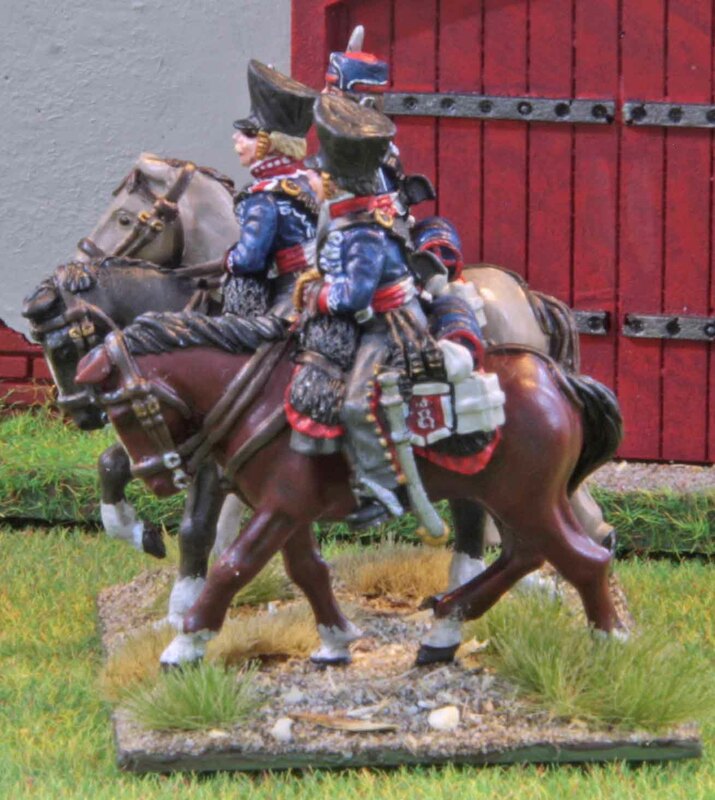 As usual minis are by Calpe, who easily turned into my favorite Prussian minis around. As I said before these were painted in two large batches and I think this was just fine, because I think I could never have stayed sane painting them in one go. But it is a bit sad to see these done, since they were the last Prussian infantry unit I needed to paint for my Möckern game. 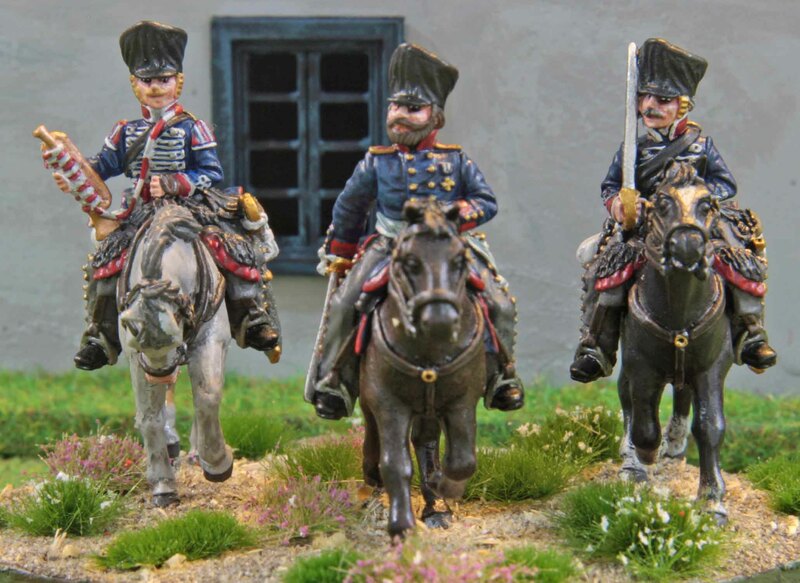 I have to say that I have grown dear to painting Prussians by now and since this means I will probably not paint more Prussian infantry for some time, I am a bit sad. No worries, I will paint more in due time, but I need to catch up on some other projects and some other allies before I can return to Prussians. 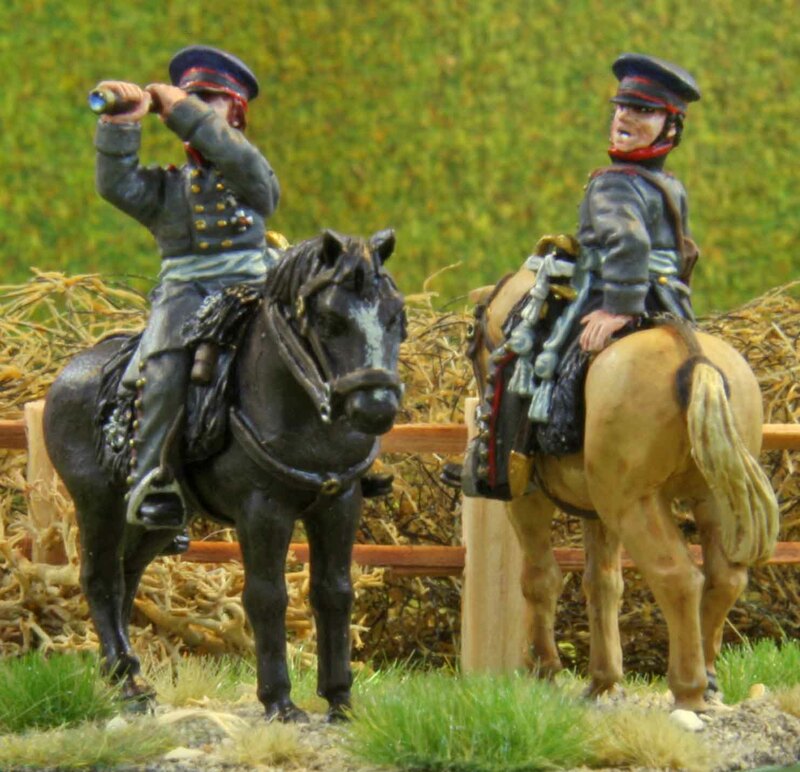 But at the same time, when I put them into the cabinet after taking the photos today… all those Prussians were a really impressive sight and I shall definitely post some group shots once the remaining artillery and officers are done. Well earlier this year I had serious doubts, if I could paint all the minis for my Möckern game at Leipzig. 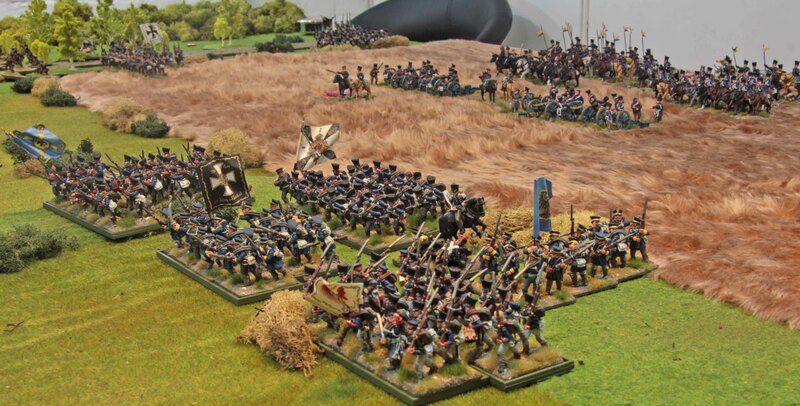 I did not make as good progress as I would have wanted last year and when the new year came there was the daunting prospect of painting all the big Prussian units for the game as well as three small French ones. So I did a mental calculation, where I would need to be at what time to have a chance for things to work out. So I decided that by the end of May I would have to be done with all the Prussian infantry, so the only units left to do would be three Prussian batteries, one French battery, said three French infantry units (which should paint up faster than usual since they will be wearing greatcoats) and a unit of Prussian Hussars. If the same goal would be achieved by the end of June, I assumed that there would still be a snowballs chance in hell for me to pull it through. So where am I now. Well as of last night slightly more than half the minis for the last Prussian infantry unit (the Leibgrenadiere) are done. 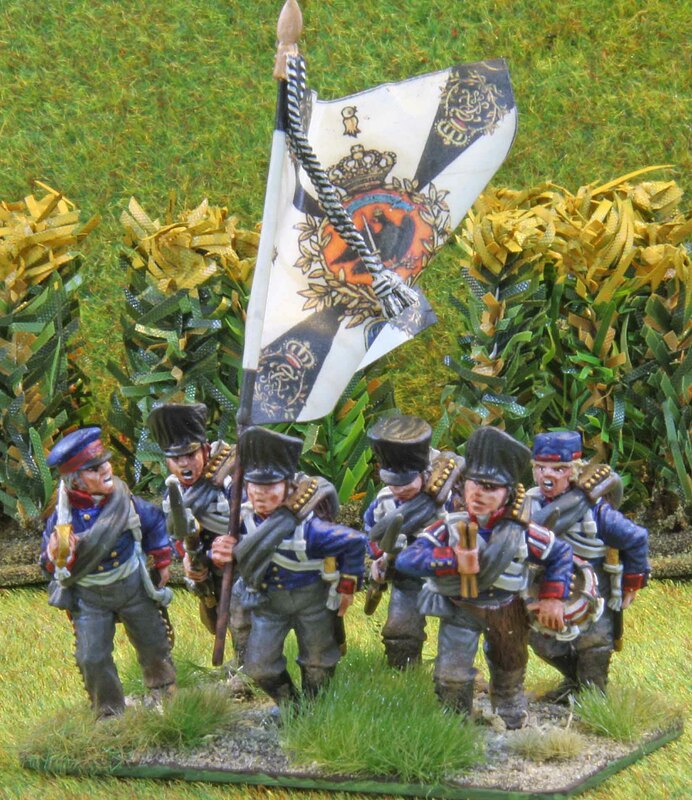 The other Prussian infantry units are done. I finished one of the Prussian batteries ahead of schedule. In addition I finished 35 minis for my 40K Tau army and the new river boards (which will also see use at Crisis) are about 70% done as well. To me this is looking quiet well, especially when I look at the fact that I hardly did anything in April. 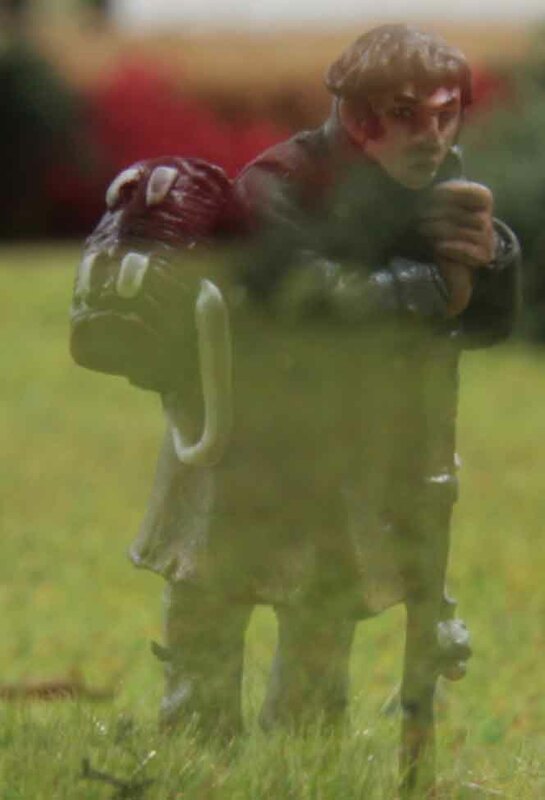 For those wondering why their shakos are still in their light grey primer state: I always make sure that there are no duplicate minis on a base. But I also make sure that no two minis on the same base do have the same hair colour. Obviously I can only make the decision, which minis go on the same base, once every mini in the unit is done, so they are still awaiting their hair. And it is a bit easier to paint the shakos after the hair, so therefore they are not done yet. Those looking more closely will see that the skin is only in its base color so far. This is just a matter of taste. I want to make sure that the mini inside the unit have the same skin tone. I found that painting skin can be a bit temperamental in this regard, so I want to do all minis in one go here. The freiwilliger Jäger is completely done, since I painted him when I was doing the Jäger for the Brandenburger. Not much danger of a bad mix on a two mini base (especially when you already know which mini is going to be based together with him). 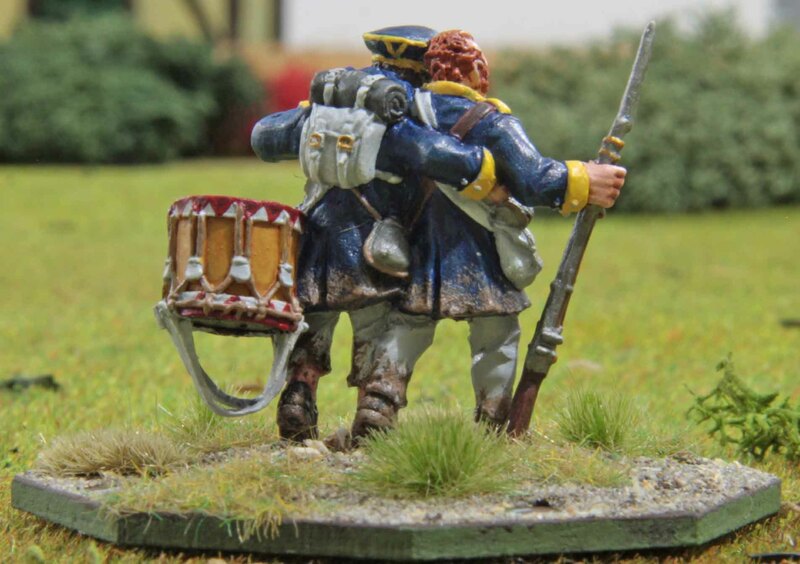 So as announced yesterday… here is the latest addition to my Prussian forces for Möckern, the first Battalion of the Brandenburgisches Infanterieregiment. The Regiment has quiet an interesting history. It was founded on the 7th of June 1808. What is amazing about them is that they had to let go of two of their Battalions during their history, with those Battalions becoming part of the Leibgrenadiere (their Fusilier Battalion in June 1813 [when then also received their numbering as Infanterieregiement 8] and the Grenadiers Battalion in October 1814), which has to say something about their quality. And they saw action at virtually ever major battle of the Befreiungskriege period. In 1813 alone at Groß Görschen, Lindenau, Colditz., Königswartha, Bautzen, Hörselberg, Löwenberg, an der Katzbach, Bunzlau, Hochkirch, Bischoffswerda, Wartenburg, Möckern, Gohlis, Freiburg a. d. U. and Hörselberg bei Eisenach. After numerous battles in France, they ended their march in Paris. 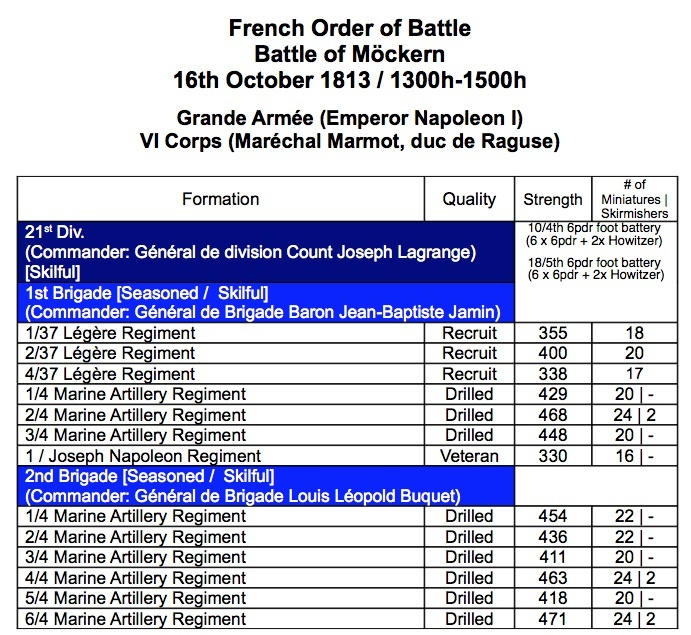 When called to fight once more in 1815 they did so at Ligny, Wavre, St. Germain and Chatillon. At Möckern they were commanded by an officer named von Zeppelin, a name which would make an impression on history later on for the airships the family invented. Unfortunately there is no Knötel drawing for them, so you will have to make do with my minis here. As usual they are from Calpe and based for Republic to Empire. 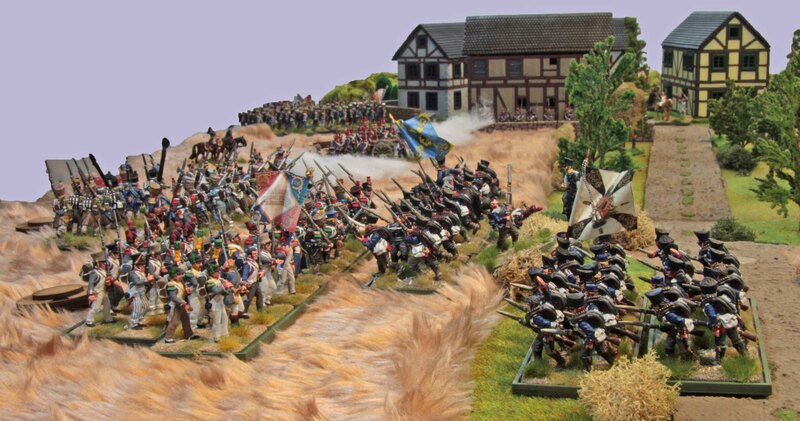 All the minis are depicted in trail arms position, the standard position for Prussian troops moving into contact with the enemy. 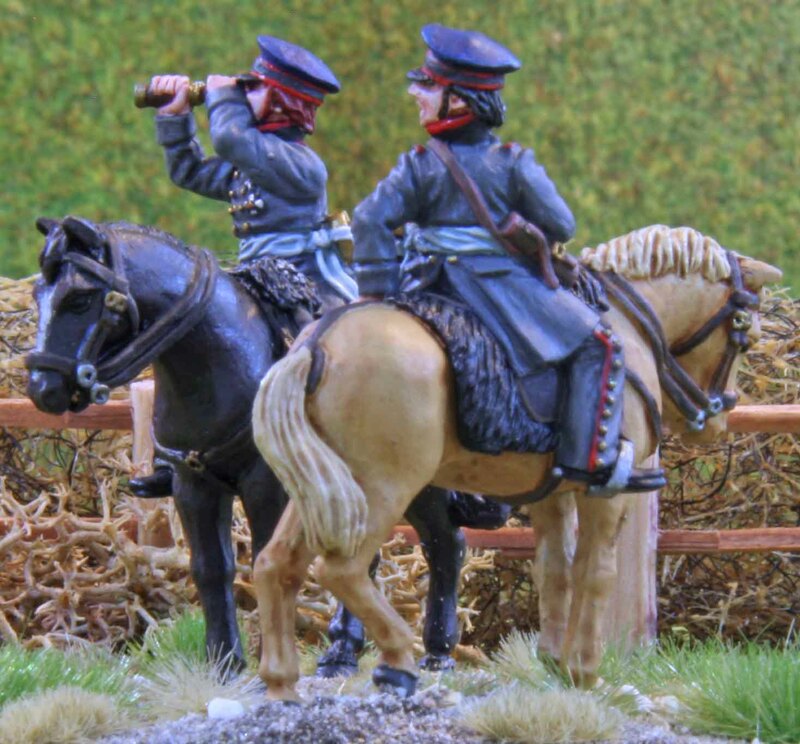 While most armies went for positions where the musket is across the chest, the Prussians wanted the soldiers to control their short swords with one hand to make sure it did not tangle up between their legs and made them stumble. At von Peter request they received tassels to their flag. Still not sure what colour they should be, so I went for black and white the Prussian National colours. This is the first unit where I actually mixed a Freiwilliger Jäger in with the rest of the troops. I had initially planned not to do that, but had to find out I had ordered one mini short of needs and was in no mood to order one single mini to make up that error! Now this is my first casualty marker I actually painted. In R2E you only start removing stands once a unit has received 50+% casualties, under the reasoning that until this point units would spread out upon receiving casualties to retain their frontage. Obviously you need a way to keep track of that, so I mounted the mini on an octagonal base, numbered one through eight. As those apt at mathematics will recognize has 26 minis and eight does not cover everything up to 50% casualties. Now my idea is to place the marker either at the left edge of the unit if they are in a Retreat moral state or on the right if in Rout state. If the number of casualties becomes larger than eight, the marker will simply be moved one base closer to the centre and rolled back to the beginning. So if the marker is placed behind the second base and shows a three, the unit has sustained eleven casualties (eight for the first base it was or would have been placed behind, plus the three shown on the marker). Hope this works out as planned! So now I am finished catching up with my entries to the Analogue Hobbies Panting Challenge (or at least I will be after this post). Before anyone asks… I ended up nowhere near the top places at 18th out of 47. Never expected any better since the points are based on numbers painted and lets face it… painting Napoleonics takes ages. But my main aim (in addition to having fun) had been to get things done and use it as a motivator to do just that. And frankly I think I did a good job at that in my humble opinion. 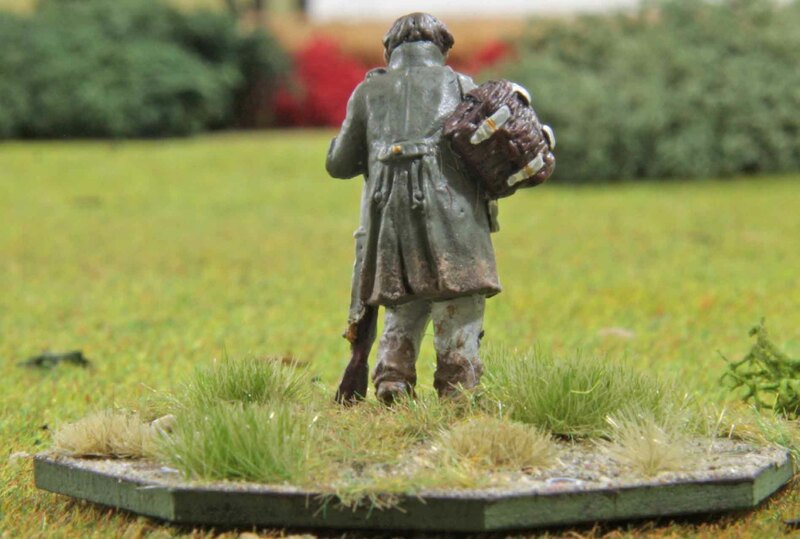 My first aim had been 500 points which would have translated into 100 28mm minis.Back then I thought “if I can achieve that number, I will be straight on course for my Völkerschlacht project”. But I still felt that it would be a though thing to do. Where did I end up? 818 points. Now if I deduce to extra points I received for a fine-looking command stand and the entry fee Samurai, this still translates into 152 minis and four guns. So I can be happy. Now the last entry was this and I only managed to finish it in the nick of time. 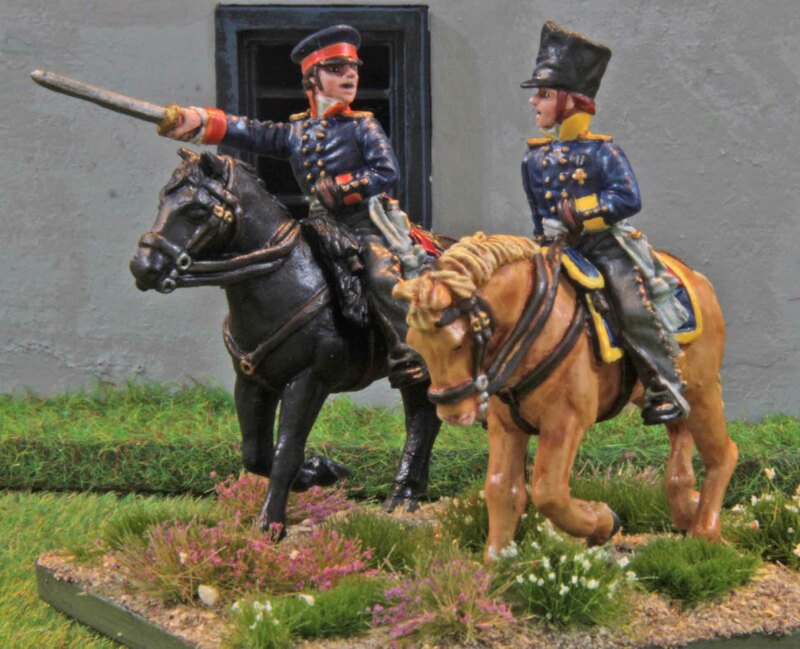 These models are to represent the Prussian Berittene Batterie Nr. 2 (Horse Artillery Battery No. 2) for my Völkerschlacht project. Not much to tell about these, since they were quiet a straight forward job. It is amazing how little I manage to get done these days. The guns were painted one weekend and the crews the following one. This was my best shot at getting the final two points to meet my target together (and to actually surpass it) with a decent entry. The worst thing was getting them based. Now I glue the minis to their base using two-part epoxy for extra strength. So that first step takes about a day to dry. The next step is applying filler to the bases to reduce the pitcher mound look from the integral bases. And there goes another 12 hours drying time. The rest of the basing is quiet straightforward with sand, tuffs and static grass, but it meant that I was constantly afraid of not being able to finish them in time. 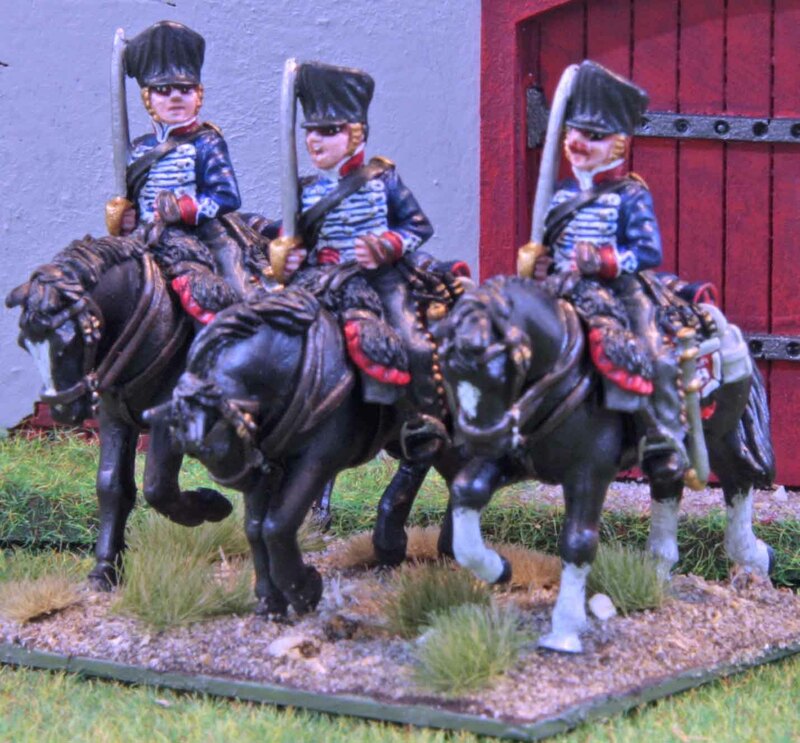 So in my quest to catch up with the stuff I painted for the Analogue Hobbies Painting Challenge… here are some Prussian officers. 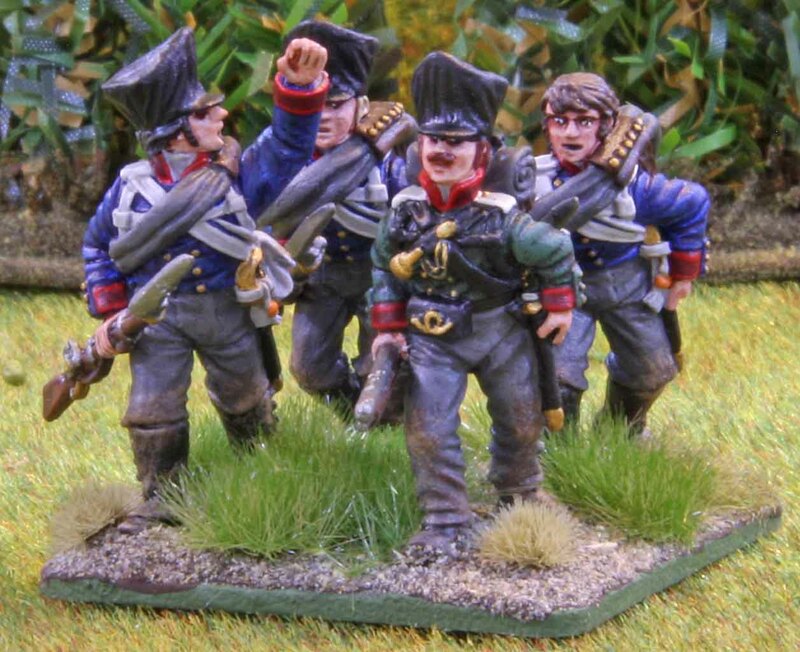 In a recent game we played, I had to use some British officers as stand-ins which resulted in some jokes that I needed more Prussian officers to prevent the Brits from stealing the glory. Plus I need a few more officers for my Möckern game anyway! One is a pair of artillery officers representing Oberstleutnant Schmidt who commanded von Yorcke´s artillery reserve that day. Schmidt was the officer in charge of one of the Prussian 12pdr. batteries when they were amalgamated on the day. He was given charge of the combined battery (well rather the large 12pdr. battery and the large howitzer battery). Now under R2E you usually do not have brigadiers (or higher) for artillery. They are either attached to infantry or cavalry brigade and act under their orders or act as independent unit and you have to pay command points for each battery. They exceptions are grand batteries and instances were actual artillery formations were used. Since the 12pdr.s at Möckern fall into that later category and since the two 6pdr. batteries were acting independently anyway, I felt it was time for one of those rare artillery commanders here. The minis and their Horses are from Calpe. I really enjoyed their businesslike simplicity. Since I could not find any information where Schmitz and the other ranking officers from the batteries came from, I took some liberties in their colour choice, going for Silesian yellow and Brandenburg red. While it might not show on the photos, I enjoyed painting the reflection of the sky into the telescope lens. I felt this gave a great counterpoint to that simplicity and serves as a good eye catcher. The other one is a Prussian officer (Perry) meant to represent the officer who commanded the second detachment of the avant-garde. Unfortunately his name is unknown, but this also gave me the opportunity to choose his facing colours. I went for Silesian yellow, since there a lot of units from Silesia in the force and it gave a nice contrast with the blue of the uniform and the red of the turnbacks. 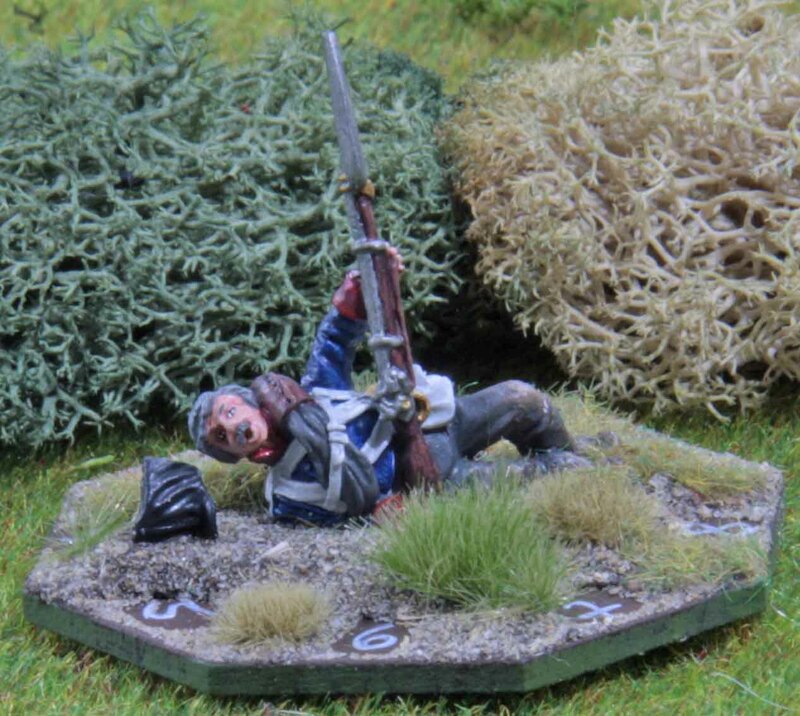 Also on the base are a French artillery casualty and broken gun from Offensive Miniatures as seen on yesterdays review. I feel that piece has lots of character and they both serve to distract from one another, therefore creating lots of action on the base. 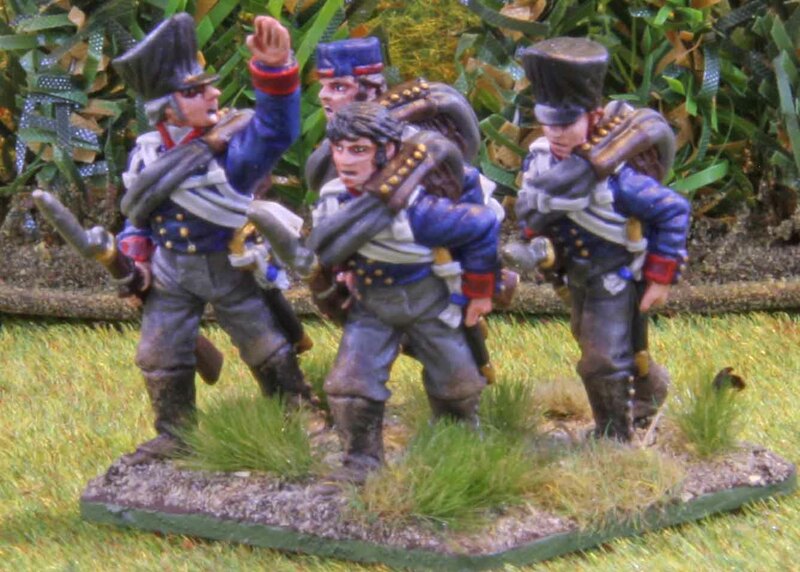 The only mood point is that I arranged them in a way that it looks like the Prussian officer is shouting to get that dead Frenchmen moving again. Please note: all material on this blog, including most of the images and all text are the copyright of DHC Wargames Club, all rights reserved. © B. Schulze, 2011-2016. Excerpts and links may be used, provided that full and clear credit is given with appropriate and specific direction to the original content.